"Jesus is very near to me. Whenever you meet with trouble and trials on your way just put your trust in Jesus and don't forget to pray." It got me thinking about last words. Many famous people are known for their final thoughts and I'll share a few of my favorites later. I've always wondered if some people purposely think up their final words ahead of time or if they just come to them. Did Martha intend to rhyme her last words or did it just happen that way? Had she been thinking of something profound while she lay dying or did it just pass her lips on a whim? Do any of you already have last words in mind? And what happens if you get really sick, say your inspired final words, only to later recover? Do you come up with new last words or do you just repeat your preplanned statement? Perhaps you just remain silent for a while, so you don't mutter something stupid afterwords. Occasionally people are misquoted and the misquote is better remembered. In some places George Washington is quoted as saying, "It is well. I die heard but am not afraid to go." This isn't exactly true. Washington uttered remark about dying hard the day before he died. His actual final words were "Tis well," but this was after he gave instructions to his doctor not to let them place his body in the vault for three days (just in case he wasn't dead). When he asked if the doctor, Tobias Lear, if he understood his instructions, and Lear told him yes, then Washington said, "Tis well." Washington may not have feared death, but he didn't want to be buried before his time. Our second president, John Adams, seemed overly concerned about his rival Thomas Jefferson right to the end, remarking "Thomas Jefferson still survives." He was wrong. 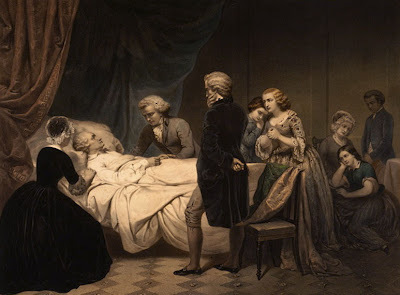 Jefferson had died earlier that same day, July 4, 1826. 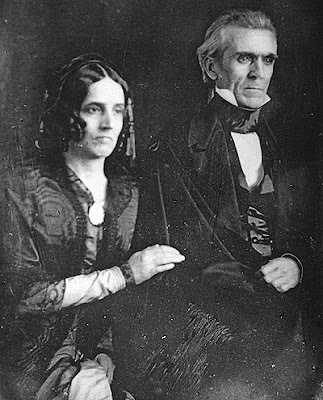 Many places record Jefferson's final words as, "Is it the Fourth?" Again, people are wrong. Jefferson quizzically asked "This is the Fourth?," the evening before he died. After this statement, when he was asked if he needed anything else, Jefferson replied, "No, doctor, nothing more." The next morning he awoke and said some things to the household staff before dying, but these words were not recorded. I think my favorite last presidential words were spoken by James K. Polk. He turned to his wife in his final moments and said, "I love you, Sarah. For all eternity, I love you." Of course it isn't just presidents who said interesting things. The occasion of the Civil War brought many famous last words. The best remembered are perhaps Stonewall Jackson's, "Let us cross over the river, and rest under the shade of the trees," and Robert E. Lee's, "Strike the tent." However, my favorite Civil War last words belong to Union Major General John Sedgwick. At the Battle of Spotsylvania, Sedgwick's artillery and staff came under fire from sharpshooters in a tree line about 1,000 yards away. His men were running for cover when Sedgwick became indignant and started yelling at his men and chiding them for cowardice. His final words were, "They couldn't hit an elephant at this distance!" Immediately thereafter, he was felled with a bullet that entered right below his left eye. Some people seem to be still concerned with their life's work. I read once that Leonardo da Vinci's last words were, "I have offended God and mankind because my work did not reach the quality it should have." I have read several other accounts of his final words, but if true, these are very sad words from a man who did so much. Dominique Bouhours, a French grammarian, appropriately quipped, "I am about to – or I am going to – die: either expression is correct." Karl Marx seemed less concerned. He grumbled, "Go on, get out – last words are for fools who haven't said enough." Other people seem more concerned over trivial maters. Although not his last words, Oscar Wilde is known to have said shortly before he died, "My wallpaper and I are fighting a duel to the death. One or the other of us has to go." They didn't have time to take the wallpaper down before he expired. The Mexican bandit, Pancho Villa, who seemed to possess great concern with his own image, forgot about the importance of final words until he was ambushed himself. Realizing he was dying, he is said to have uttered, "Don't let it end like this. Tell them I said something." As for me, I haven't decided what I wish my final words will be. How about you? Great post, I too have been drawn to the history in cemeteries. Obituaries provide a huge wealth of history. Grateful for all the time you devote to your blog. Its like going to a History Class. Thanks. I don't have any preplanned Last Words....I'm not sure what we will have for dinner. tee hee. Interesting post. I have no idea what my last words will be. It did get me thinking about how they are recorded, remembered and even misattributed in history. For those who have an interest in last words. A couple months ago, what is perhaps the definitive reference source on the topic was released-- Last Words of Notable People (covers over 3500 people). Not a sales pitch for the book -- author gives out many free every day via twitter on the anniversary of the persons death. I think it is fascinating stuff. My favorite topic. Some of the last words drawn from sources and the Internet lack firm historical backing. Wilde's real last Words were covered the other day on my Twitter site @refdeskpress . I am the author of the book referred to in the post above -- got a Google alert that the book title was mentioned so I thought I would chime in if that is OK. Thanks. Great topic. Thanks for commenting, everyone. Thanks also to Anonymous for pointing out a reference book I was unaware existed. You may not want to plug it, but since the author was kind enough to write in, I will recommend the book "Last Words of Notable People: Final Words of More Than 3500 Noteworthy People Throughout History," by William B. Brahms. You can purchase it through Amazon.com. You can even see a page preview to see what it's like. Looks like Mr. Brahms has put a lot of work into providing sources for all the great quotes. Truly a labor of love. I'll have to start saving my pennies so I can buy a copy for the classroom! My husband thought I was a little odd when I took the kids to see the headstones and read the dates. We had such a great time finding some really old ones in Jacksonville, OR. By then my husband was interested too. A strange family field trip, but full of good discussion. My old friend passed on in the eightys. He and his wife had worked hard all their lives. They had a good sum saved when they retired. They would fly to Las Vegas at least every month or two. Someone asked me If I had seen his headstone. I drove up to the cementery to look. "I'D RATHER BE IN VEGAS"
My friend's mother passed away recently and she was cremated. There was no epitaph but if there was one it would most likely be her favourite motto: "No cry-babies." I doubt very much I'll have much choice over my last words, because it will probably be a surprise. What I would like them to be would be the quote from STRIPES as Bill Murray and the MP climb out of the General's footlocker: "Well. That was interesting."